These grow lights are of the same design as our 18 watt (60 cm) and 36 watts (100 cm), but with more power. 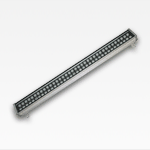 These rails come in two varieties of 48 and 72 watts for users and plants that require a bit more power. If you have more light-demanding plants the 72 watt plant lights will be of good use and for those with less light demanding needs 48 watts rail may be a better choice. The grow light rails are ideal for mounting directly to the ceiling, to spotlight an area with plants without becoming tedious on the eyes because of the narrow lighting angle. Since the rail brackets can turn 180 degrees, rails can also be mounted straight on the wall and turned downward to lit plants standing along the wall. Plant lights are supplied with 1.5m cable, EU plug connector and brackets for stable mounting. One of our main requirement when we create new lights is that they can run continuously without mechanical cooling, because fans often make a lot of noise that can disrupt environments where you would want peace and quiet. All plant lighting we produce therefore have robust metal housings which effectively dissipates heat from the diodes and plant lights without any need of fans. Many other manufacturers usually use the cheaper light housings and install one or more fans, but we believe it creates discomfort and does not belong in the home or work environment. Unlike other manufacturers, we use wavelengths that are fully optimized for the plants' different pigments. With plant lights from Gemma LED, you get a light that is both optimized for your plants but also comfortable to stay around. 72 watt grow light is out of stock.